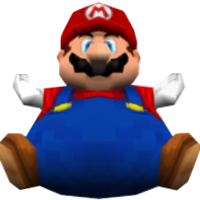 Balloon Mario (referred to as Floating Power for Super Mario 64 DS) is a form of Mario first appearing in Super Mario World, and later appearing in Super Mario 64 DS. The former appearance requires the player to get a Power Balloon to obtain this form, and the latter requires a Power Flower. Mario or Luigi swells up like a balloon, causing him to hover in the air. They will gradually float upwards if not moved by the player, but is capable of moving in any direction for a limited amount of time. During this time, Yoshi cannot be ridden. Mario or Luigi will start to flash when the item is about to wear off, and once it does, they return to normal size and drop out of the air. The level Tubular in the Special Zone requires the player to continually pick up new Power Balloons to maintain flight while they make their way across the level. If Mario or Luigi pass through a Giant Gate while under the form, they will gain a bonus Super Mushroom. In the remake Super Mario World: Super Mario Advance 2, the game music's tempo is slightly decreased while Mario or Luigi is in this form. Balloon Mario also appears in volume 6 of Super Mario-Kun, being featured in a single chapter. Mario, Luigi, and Yoshi are shown with these forms throughout the chapter. The form and its effects returned in Super Mario 64 DS where, upon picking up a Power Flower, Mario would inflate like a balloon and float. 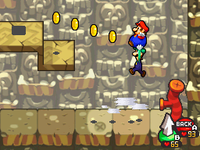 The control scheme for this transformation has been changed somewhat; Mario now gradually floats downwards instead of upwards, and has to be kept in the air by tapping the jump button, similar to swimming in 2D Mario games. Once again, he flashes when it is about to wear off and plummets when it does. The player can also automatically end the transformation at any time by Ground Pounding. Mario is the only character who is affected this way when he picks up the Power Flower. In Super Mario 64 DS, the music that plays when Mario turns in Balloon Mario is a slow-paced arrangement of the Wing Mario theme. In Mario & Luigi: Bowser's Inside Story and its remake, Mario can walk into an air vent and become inflated. Luigi can grab onto Mario, allowing them to jump higher and slowly float down. The brothers learn the skill at Toadley Clinic after they get the second Star Cure, when Dr. Toadley's intern asks them to catch Birdley flying in the clinic. While this form isn't usable in Super Mario Maker and Super Mario Maker for Nintendo 3DS, knocking on a Warp Door in the Super Mario World theme may cause Weird Mario to appear in this form. ↑ Mario Mania, pgs. 72, 73, 74, 107, 156 & 160. This page was last edited on April 9, 2019, at 14:38.